The Real Absinthe Blog: New Orleans, Tales of the Cocktail, Absinthe. And more absinthe. New Orleans, Tales of the Cocktail, Absinthe. And more absinthe. "Ranked #1 in the Nation in Liver Transplants?" Yes, that's the sign at New Orleans Airport. We can't claim we weren't warned! "New Orleans has always been the centre of absinthe culture in the United States." (Source: The Absinthe Encyclopedia). That sounds more like it. New Orleans: the home of Tales of the Cocktail, probably the world's biggest event for bartenders, drinks brand ambassadors and owners, and anyone else who is interested in cocktails. The word "probably" may not be needed there. Yet after more than 20 years in the drinks business and after nearly nine years promoting absinthe, 2013 sees my first visit to Tales and my first visit to New Orleans. And for my first visit, I'm privileged to have been chosen to run a seminar in front of 170 people who probably know a whole lot more about cocktails than me. Luckily I will have help for that! I arrive in New Orleans a full three days before our seminar, because I want to absorb the atmosphere, see some of the bars (especially those selling absinthe), and attend a couple of other seminars to see how the more experienced Tales presenters handle the event. The Old Absinthe House is about 100 yards from my hotel (the Monteleone) and I don't want to exert myself in the legendary New Orleans July heat and humidity. I'm pleased to say it was hotter in both New York and in London, and NOLA had nothing like the humidity I experienced living in South East Asia. 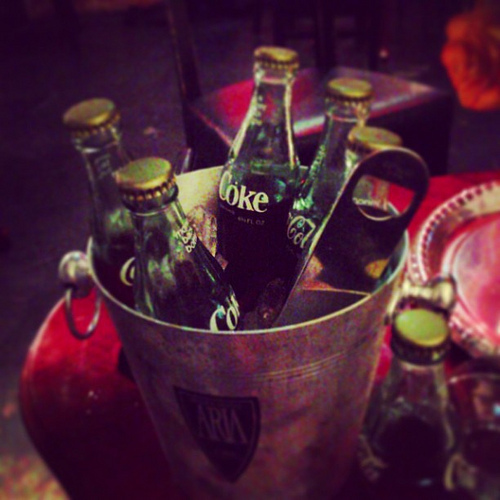 As well as the classic drip, the Old Absinthe House offers absinthe cocktails, including the Absinthe Frappé that was created here. but I decided to have my first NOLA Absinthe Frappé at one of the most famous mixology bars in New Orleans: Cure. A great bar with wonderful cocktails and a good selection range of quality absinthes: La Clandestine, Vieux Pontarlier, Nouvelle Orleans and Ridge Blanche. A working day, finalising my presentation. Later I had my first Sazerac in NOLA at Sainte Marie. Made with Herbsaint as seems to be the norm in New Orleans. 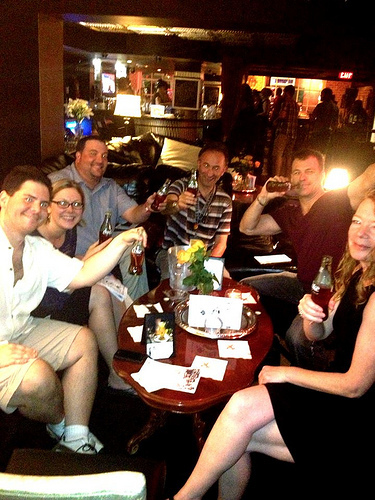 Later that evening we went to the Copper Monkey Grill in the French Quarter. Quite a big range of absinthes including La Clandestine, Nouvelle Orleans, Lucid and Kübler. They also carry Grande Absente, Mata Hari, and La Fée. Classic drip used. The first day of Tales, so I attended a couple of seminars, mainly to learn from other presenters how they managed the combination of entertainment and content. The Art and Philosophy of Hospitality had a star-studded cast, led by Jacob Briars. The cast were both entertaining and very interesting, and I saw a lot of notes taken by the audience. Midnight in Paris: Cocktails of the lost generation closely ressembled the theme of my seminar, and I enjoyed seeing how Philip Greene made the seminar highly relevant to a bartender audience AND interesting to a student of Hemingway and Paris. as well as the very interesting barrel-aged version of La Clandestine (not yet legally available in the USA). Wednesday evening: no bars visited. I was inspired by the seminars I had seen to amend our own presentation, so had too much work to venture out. Or maybe I went out for a quick drink at the Old Absinthe House? Much of this week has become a blur when looked at two weeks later, so maybe I did ..
More than 8 months after submitting our seminar proposal to Tales of the Cocktail, the day to deliver it had finally arrived. Hundreds of emails, Facebook messages, texts, conversations, and meetings; hundreds of hours of research; all would all come down to 90 minutes that afternoon. And I was doing just one seminar. Imagine all the work done by Ann Tuennerman and her team at Tales to put on more than 50 seminars and hundreds of other events.. But first one more seminar to watch: Modifiers: Eternal Life for Cocktails, led by the irrepressible Philip Duff, followed by the Indie Spirits that Rock mini-exhibition. How strange to run into Simon Difford here, and to have the opportunity to discuss my absinthe with him briefly: we'd both had to fly in from London to meet up in NOLA! And, of course, that's what makes Tales so special: the meetings planned and unplanned with colleagues, customers, and competitors: I met customers - and prospects - from all over the USA and the UK at Tales (and from a few other countries I won't reveal here since my competitors may be reading). I've already covered part of the seminar I presented with London's Savoy Hotel in a previous post, In addition to the Maid in Cuba, we tasted three relatively unknown 1930 Savoy cocktails presented by Erik Lorincz: the Blackthorn, the Atty and the Jeyplak. The Blackthorn is one of several Savoy absinthe cocktails I had not tasted before: the ingredients worked well together. The ATTY and the Jeyplak are just two of many absinthe cocktails from the Savoy that also have gin and vermouth. The addition of Creme de Violette in the former enhanced the cocktail from both taste and visual standpoints, and hopefully inspired the audience to think again about many of the cocktails in the Savoy: as fresh and original today as they were 83 years ago. 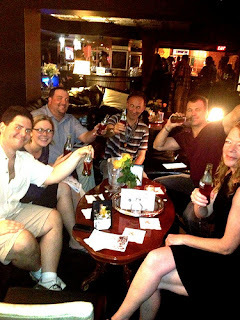 Some of my readers will know that our seminar was sponsored by Pernod as well as by Plymouth Gin and Drink Up New York. I told our audience that Harry Craddock didn't make as much use of lemon/lime juice with absinthe as he could have. Modern mixologists agree with both Pernod and La Clandestine in making some great cocktails with absinthe, lime juice and sugar or simple syrup. In Pernod's case: the Green Beast. In La Clandestine's case: the Clandestino. Talking of which, it was nearly time to let my hair down and celebrate the completion of our seminar and turn to some refreshments. But firstly I had the opportunity - and the pleasure - to meet and share a drink or two with César Giron, Mathieu Sabbagh and Anne-Louise Marquis of Pernod, along with Brian Robinson, Review Editor of the Wormwood Society and Maxwell Britten from Maison Premiere, probably the best absinthe bar in the USA. Brian and I tasted the "Original Recipe" Pernod Absinthe; the Pernod team tasted La Clandestine. As others have commented elsewhere, Tales is the type of event where one puts aside all competitor issues, so it was good to put faces to names and to have a good chat and share drinks with the team at Pernod. Santé! After that, it was off to a Spirited Dinner, organised by my friends at Montanya Rum. I couldn't resist the opportunity for some low key branding! My last working day in NOLA, and two more very interesting seminars. Between seminars, I went to Cane and Table (at the old site of Pravda), and owned by the owners of Cure, featuring a pop-up bar operated by the team at Dead Rabbit, NYC. I had had the opportunity to go to Dead Rabbit twice the previous week and loved it: so it was great to meet new/old friends again. The Dead Rabbit would go on to deservedly win several awards at the Spirited Awards dinner the following night. Cane and Table currently stocks Pernod, while Dead Rabbit NYC stocks Pernod, La Clandestine, Duplais Verte, Vieux Pontarlier, Kubler, Lucid and Nouvelle Orleans. and enjoyed a drink or two there ..
Nice to see that they can get some great theatre into absinthe without resorting to fire. Pirate's Alley stocks a good range including La Clandestine, Kubler and Lucid, and prices are very reasonable. Now what did you expect me to drink? Next stop was the Boubon-O Bar run by the amazing Cheryl Charming. 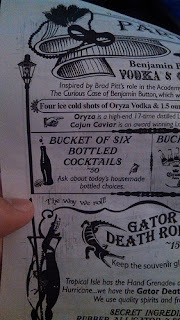 Creativity is very much alive here: we enjoyed a bucket of pre-mixed, carbonated Sazeracs. Cheryl tells me that the Sazeracs are "CO2 carbonated Perlini Sazeracs in 1960s - 1970s Coca-Cola bottles dug up in the grounds of NOLA. It took several cleanings and sanitizing to get them ready for the Sazeracs!" 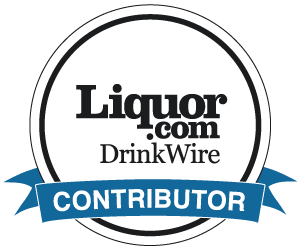 Bourbon-O only carries Lucid "in honor of Ted (Breaux)'s hard work and money getting it into the US." So it was good to enjoy Bourbon-O with Ted himself. So that was my working week in NOLA. Delta seemed determined to extend my stay in the USA, so I returned from NOLA via Nashville, Atlanta and JFK to Heathrow. My suitcase took another 3 day holiday in Boston. Maybe we just couldn't bear to leave. NOLA and Tales were amazing. The best experience of my 24 years in the drinks business in a great city with wonderful food and even better company. People I had never met before became life-long friends. And the Tales team from Ann and Paul, the full-time staff and then the Apprentices: all played their part in making the event unforgettable. And the absinthe in NOLA? Lucid, Nouvelle Orleans and La Clandestine were in most of the bars I visited, although some of the more traditional bars prefer to serve Herbsaint. There is nothing like the element of burning absinthes that I had been led to believe. 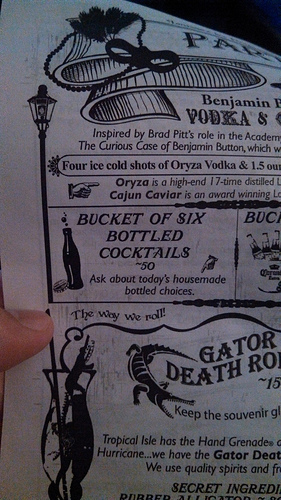 Maybe the battle to get good absinthes served correctly has nearly been won in NOLA. Maybe I'll go back in 2014. Just to check. Thanks to several people for some of the photos here, especially Brian Robinson!